The 2019 Chicago Cubs just can’t get out of their own way. A team only three years removed from a World Series championship that’s made the playoffs the past two years and has a historically-high payroll this season should be cause for some good stories, but they’ve stumbled to a 3-7 start on the field, even with a 10-0 victory over the Pittsburgh Pirates Monday. But even more than the on-field blunders, the organization has really shown its ineptitude with a series of preventable off-field blunders. Those blunders started with some problematic comments from chairman Tom Ricketts about shortstop Addison Russell and his past violations of MLB’s domestic violence policy. They continued with Splinter News’ publication of a series of racist emails from Joe Ricketts, the patriarch of the Ricketts family, and with a lackluster response from the Cubs. Another blunder came from Tom Ricketts saying “we don’t have any more” when asked about money for signing free agents, despite the family being worth over $5.3 billion and despite the team leading MLB in operating income ($102 million) in 2018 and placing third in revenue ($457 million). And now, they’ve escalated with a very dumb PR foul. Cubs spokesman Julian Green said the initial intent of the image was to acknowledge how far society has come since 1945. He also said that the Cubs didn’t mean to offend anyone with the image, but acknowledged it was in “poor form” for the team to put it on display without context. Green couldn’t explain who signed off on the art, which was installed late Sunday night. 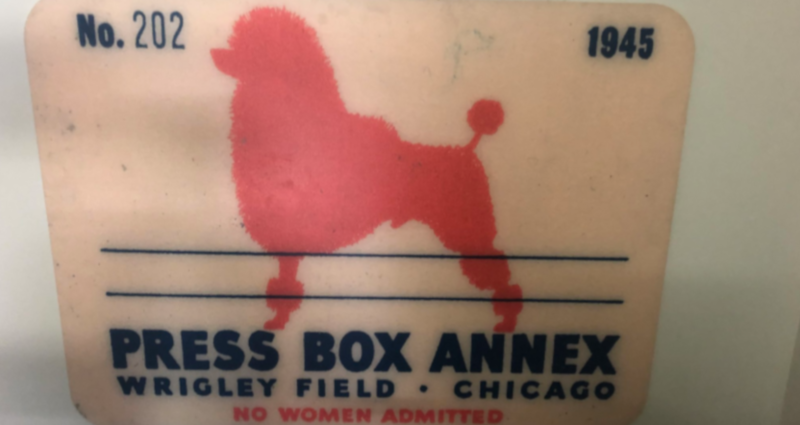 Cubs business president Crane Kenney recognized the image when showed on an iPhone as the “Pink Poodle.” But he refused to comment on it, saying he couldn’t read the “no women admitted” text because he didn’t have his glasses. At Kenney’s request, the picture was emailed to him so he could read it before making a statement. Green responded on the club’s behalf. Green said the image was installed as part of the Cubs’ 1060 Project. Yes, it’s a decent idea to use historical images in your stadium, and the press box can absolutely be a part of that. But there’s still a lot of unnecessary pushback towards and barriers for women in sports media, and posting even an old “No women allowed” sign is going to give the wrong impression and create unnecessary PR drama. And the team’s business president saying he can’t read that photo without his glasses and declining to comment on it even after an e-mail is a lame approach, and not a helpful one. We’ll see if the Cubs can learn from their mistakes here, or if they’ll be stepping on yet more rakes going forward.